Posh manager Dave Robertson has been dismissed. Football is a brutal, ruthless business and another good man has been hurt today (September 6). 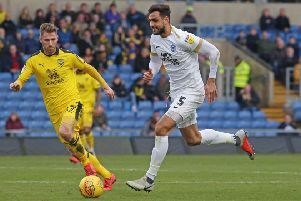 Posh chairman Darragh MacAnthony has acted wisely, and certainly in the best interests of Peterborough United, by removing manager Dave Robertson while there is still plenty of time to rectify a disastrous start to the season. Posh manager Dave Robertson with chairman Darragh MacAnthony. But that doesn’t alter the fact that a man with Peterborough United at heart, and a man who has delivered a decade of loyal service to the club, has been sacked while others. who are almost as cuplable, remain, in some cases, on pretty lucrative contracts. Robertson was a solid leader of the Academy. He inspired loyalty and dedication from teenage players, but a man who never played above United Counties Premier Division level and who had never managed an adult professional side before replacing the most successful manager in Posh history last February clearly found the step up into the cynical, hard-nosed world of League One too tough to take. A limp 2-1 defeat at Southend yesterday (September 5) in front of live TV cameras was the last straw for MacAnthony. The loss against a team who hadn’t won all season should have been heavier and the future had started to look horribly bleak. Robertson won the Football League sack race - he was unlikely to win anything else this season. It always seemed a strange appointment and the well of sympathy his sacking will doubtless provoke should be diluted by Robertson’s own bullish behaviour in the summer. He confidently predicted he would do a great job - he even revealed that he’d been disappointed not to get the job before - and he was soon forecasting promotion, a forecast that looks positively Michael Fish-like just six games into the League One season. Robertson should be thanked for clearing up the mess left behind by Darren Ferguson’s dramatic loss of ability. Posh won five of Robertson’s first six matches in charge to allay fears of a relegation battle. Robertson installed defensive discipline and long-ball tactics, but the danger of such a style is the criticism it attracts once the bad results kick in, which they did before the end of last season. The signs were there in May that Robertson might find first-team football difficult to manage, but he went on to reportedly beat off 200 other applicants to form a rookie management team with Grant McCann. They apparently produced a 35-point plan with which to impress MacAnthony, but sadly points from on-field performances were harder to find. Put simply Robertson was a good man - certainly one who didn’t deserve the negative reaction he received from some Posh fans after yesterday’s game or the dismal form of players he kept selecting - but a man out of his depth nontheless. If the dressing room team-talks were anything like his press conferences there were probably as many confused looks among players as there often were among journalists. After the Gillingham game Robertson stated ‘it’s important to defend my players’, but after a defeat at Millwall four days later his tune had changed and ‘I can’t defend my players’ left his lips. It was the behaviour of a muddled thinker, one that was struggling to make sense of his situation. Robertson’s comments also aped some of Ferguson’s comments late into his reign. Telling his players to self-motivate was akin to admitting he could no longer do it. Lose a dressing room, even one under-performing horribly, as Ferguson found out, and the end will always be nigh. MacAnthony can also not escape criticism. He has made just two successful managerial appointments in six attempts, and they were both called Darren Ferguson. His next appointment is absolutely crucial as Posh appear to be in steady decline. It’s understood that at least one of those interested in the job in the summer baulked at the size of the Posh playing budget. MacAnthony, who at least in acting decisively today has surely rubbished claims that his interest in Posh is on the wane, has invested millions in his club since taking the helm in October, 2007, but money still speaks loudly, even in the third tier of English football, and it’s likely further investment, lots of it, will be needed to turn this season into a promotion push. Staying out of relegation trouble might have to suffice for now. It’s unlikely that MacAnthony would turn to Ferguson, who remains out of work and was seen taking copious notes at the Chesterfield/Wigan game in League One yesterday, for a third time. Grant McCann will have the job at Oldham next Saturday, but surely it’s too early in his managerial career, a point that will still stand even if Posh receive the bounce in form a change in manager often inspires. McCann working under a more experienced manager should be way forward, but likely candidate Steve Evans remains happy in the Championship at Rotherham and fanciful candidates like Brian McDermott remain, well fanciful. Former Stevenage manager Graham Westley was at Southend yesterday, but as much as the Posh squad need a wake-up call, this eccentric performer will hopefully be discounted.